They thought they were doing the right thing. They figured at least one adult in my household would have a normal-sized head. They thought wrong, and a child suffered. Well, Archer slept through the whole thing, but one day, years from now, I'll pull up this post and then he'll suffer. Until then he'll remain blissfully ignorant that he was a cog in the relentless wheels of THQ's Company of Heroes 2 PR machine. 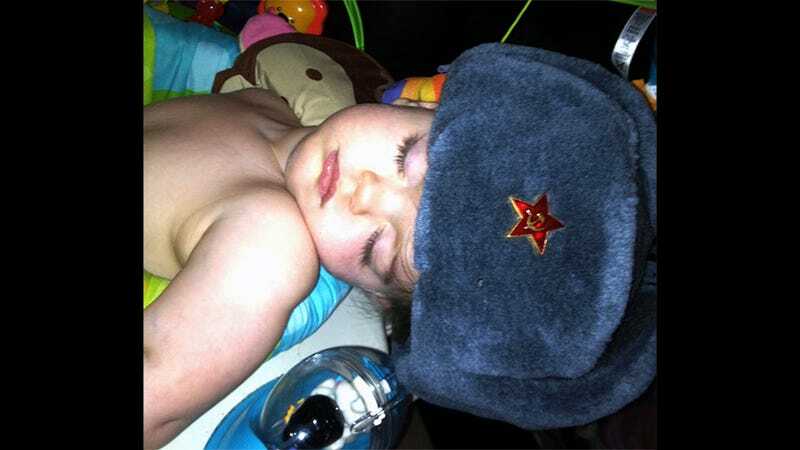 He'll say "But father, I don't want to join the Red Army!" to which I will reply, "Not a lot of people did, son." Then we'll laugh and laugh. Along with the tiny fuzzy hat came a card that read: "операция красный снег готовиться к холодному фронту, товарищ". Fifteen minutes in Google Translate later and I deciphered the message: "Operation Red Snow — Prepare for a cold front, comrade." Well at least someone in this house is prepared for a cold front.